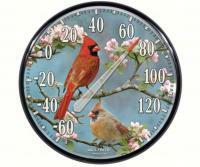 12-1/2" dial thermometer featuring stunning goldfinch artwork. Accurite's exclusive licensed artwork has been beautifully captured on this easy to read durable and attractive thermometer. This was purchased as a gift for a friend. She is very happy with it. 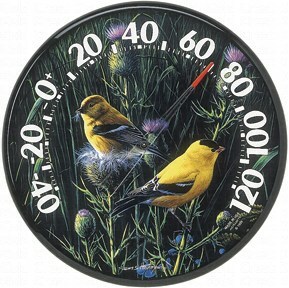 I bought the Audubon Collection Goldfinches II thermometer for my adult son's birthday. He is confined to a wheelchair. The Goldfinches are beautiful and very nice size. 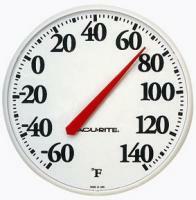 The thermometer is easy to read and just the right size. We love having the Audubon thermometer as the numbers are easy to read and the temperatures are accurate. We have this on our deck in easy view from our sun room. I enjoy looking out my kitchen window and seeing my thermometer. I wish it had been easier to hang since it is outside. The delivery was nice and quick.